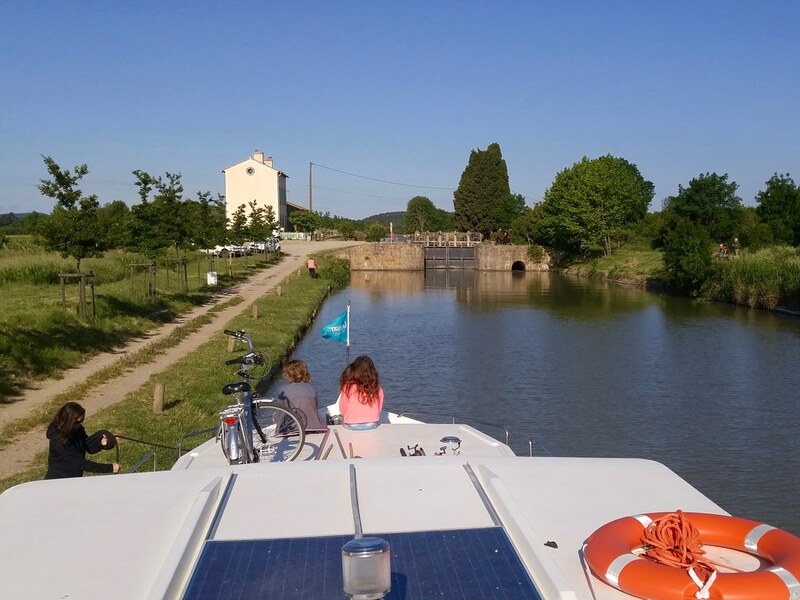 On the weekend of the second round of the French presidential election I, Ruth, and our kids took a three night cruise with another family of friends on the Canal du Midi. It was much more interesting than I expected. The Canal du Midi connects the city of Toulouse and the Garonne River (and thus the Atlantic Ocean) to the Étang de Thau and the Mediterranean Sea. It was constructed between 1666 and 1681 under the direction of Pierre-Paul Riquet. By a series of 91 locks the canal steps up from 130 meters above sea level in Toulouse to a 190 meter high divide at the Seuil de Naurouze before stepping down to sea level in Sète. There are 57 kilometers of canal on the Atlantic side and 189 kilometers of canal on the Mediterranean side. How to supply such a canal with water was a problem that stumped engineers for many years. Riquet and his team found an overlooked source in the montagne Noire and built a reservoir, the second largest in Europe, by damming the Laudot river, a tributary of the Tarn and the Garonne, about 20 kilometers from the summit at Seuil de Naurouze. The canal has been expensive to maintain and was never much of a trade route, but has found a second life as a tourist attraction. Boat rental companies, restaurants, and boutiques are found in many of the villages traversed by the canal. I've made a dataset with 36 points of interest along our cruise and used it as a layer in the map below. 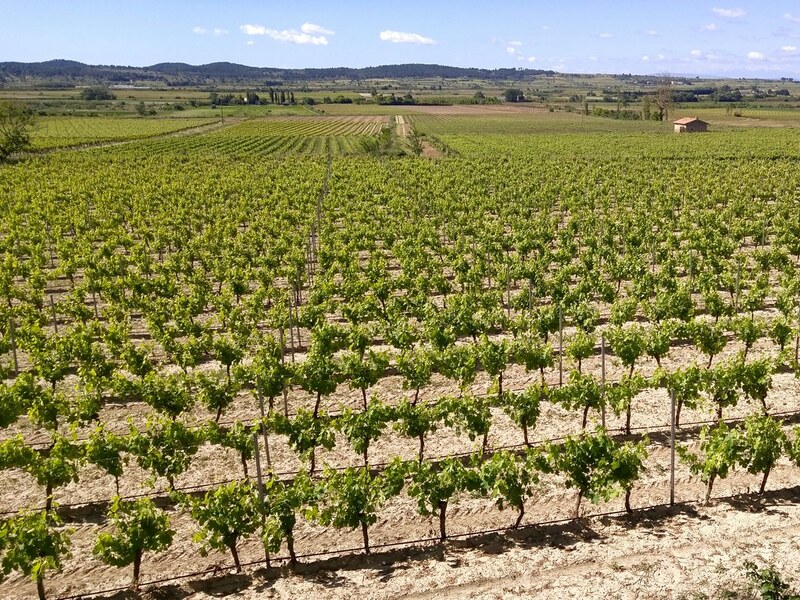 We put in at Argens, in the Minervois region, and cruised past some of the largest expanses of grape vines in France. The vines on the left bank of the canal (generally north) are of Minervois, those of the right bank, Corbières. Plane trees were planted along the canal in the early 1800s to stabilize the banks and reduce evaporation by shading the water. Today the trees are dying from a fungal (Ceratocystis platani) disease. VNP, the Voies Navigables de France, intends to cut down every diseased tree (and this may eventually be all of them) and replace them with resistant varieties of plane and other shade trees. We saw signs explaining the replantation project at every long treeless bank. Since 2006, a third of the canal's 42,000 plane trees have been cut down and removed. Mapbox's imagery of Capestang, a village on the canal, is out of date. We (I work on the team that makes the satellite basemap) will update it, but until we do it affords a look at the way things used to be on the canal. Below you see that the canal in the village was bordered by huge shade trees. You can also see that some of them to the right of Capestang's newer metal bridge are completely dead. We moored in a different very different Capestang from the one in the map. The trees that lined the banks of the canal have been removed, every one. Saplings have been planted between the stumps of the plane trees, but it will be many years before the canal is completely shaded again. We were a party of 10: 4 adults, 5 kids, and a dog. Our large pénichette had 4 cabins and slept 12. It was a tight squeeze at a few bridges and windy conditions made the passages extra challenging. The canal is only 2 meters deep at the most, thus these recreational barges displace very little water and blow around easily. I failed at Capestang's narrow and angled old bridge on the second day and we had to get some help from a friendly local boater. Our boat had many patches around the edges, so apparently we weren't the only ones having difficulty at the bridges. If I were to do this again, I'd go for a shorter and less wide boat, especially if the group were smaller. We were on the canal for 3 days and nights and covered a lot of distance. 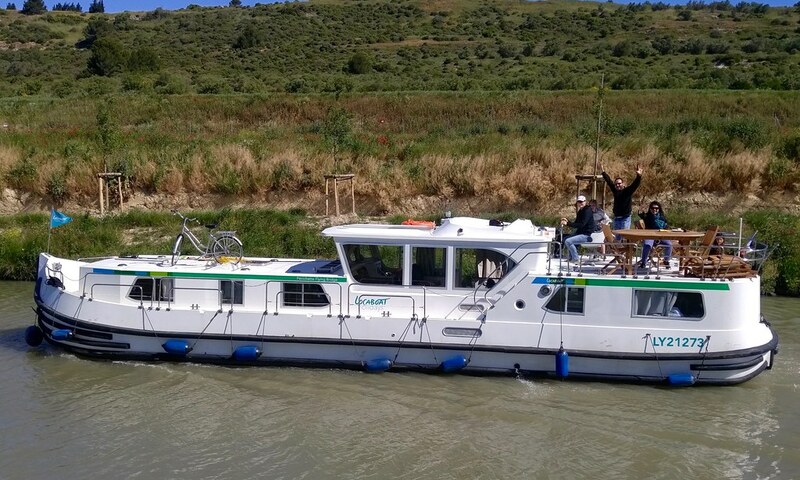 It's 94 kilometers from Argens to Colombiers and back and we probably did 5+ hours of boating on each of the second and third days. This meant passing by some villages and chateaux that would have been fun to visit. 2 hours of cruising per day and 3 hours of walking would be more my speed. 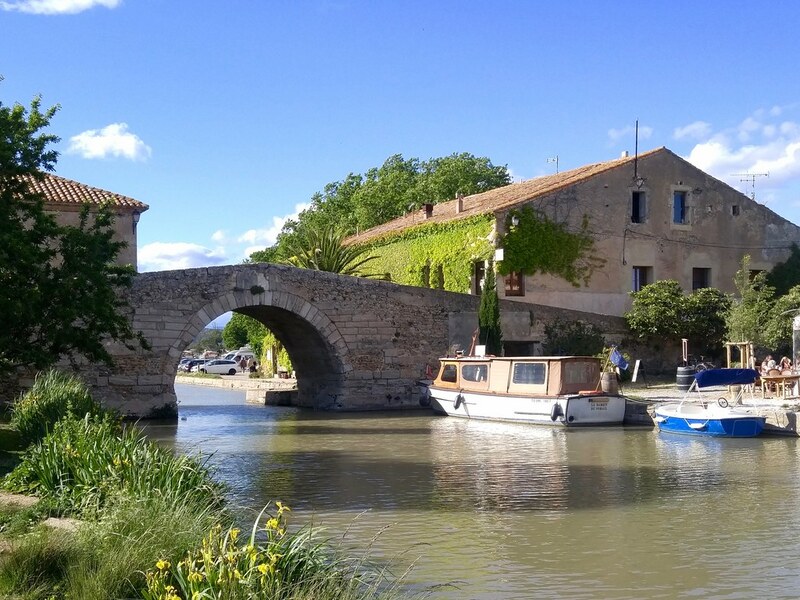 Doing a lot of cruising did let us see a lot of interesting places on and along the canal such as the pont-canals of Répudre and Cesse. The pont-canal over the Répudre river was the first of its kind in Europe. Traversing it was the first time I'd ever been on a bridge in a boat. Another sight that you really have to see from on deck is the Tunnel de Malpas. 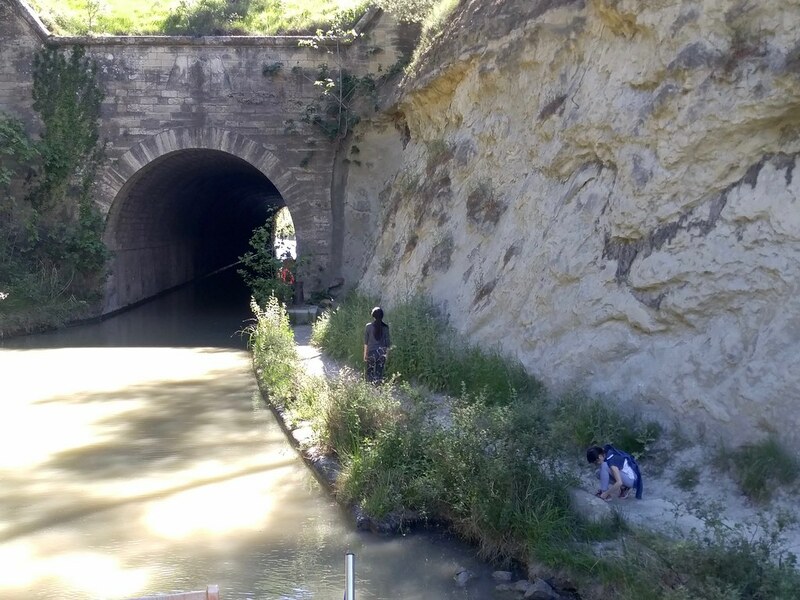 160 meters long, it was the first canal tunnel ever constructed. The Roman Via Domitia came over the hill at this same spot once upon a time and an SNCF tunnel for trains between Béziers and Narbonne passes underneath. I've now passed under this hill by both train (on my family's trip to Barcelona) and by boat. On the return trip, I got off the boat at Malpas and ran the 12 kilometers to Capestang. The canal-side trails are well maintained and we saw many cyclists, some of them with loaded paniers. Le Somail is a cute little village with several nice restaurants, an ice cream shop, and a remarkable used book store, le Trouve Tout du Livre. The old stone bridge is typical and a tight squeeze. I had to duck to get under while piloting and we had only a foot or so of clearance on either side. Waiting for a lock to open. There's only one lock between the villages of Argens and Colombiers: the 2.4 meter high Argens lock. On the downstream side of it is the canal's longest pound. There's not another lock until Béziers. We went through this lock once on the way out and once on the way back. It took about 15 minutes to go through. I found the process captivating. Boating is fun and piloting a barge was a new experience for me. There are dozens of new skills to learn and even though I didn't master any of them, it was fun to try. The scenery was great. The canal itself is a fascinating artifact. 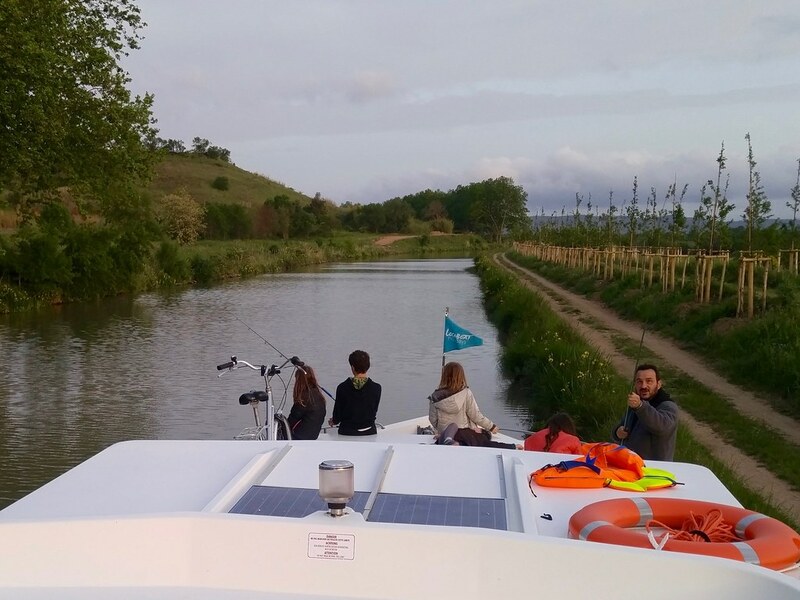 If you've ever wanted to do this kind of trip, do it in May while the weather is warm but not too hot, and do it before all the plane trees are cut down!